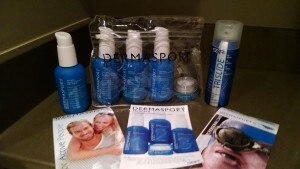 DERMASPORT Skin Care line: Taking care of the athlete’s skin. A few of SBR Sports’ products. 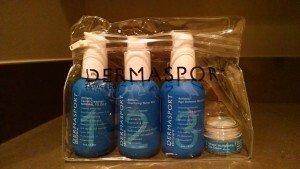 DERMASPORT Skin Care is a line under the SBR Sports umbrella. These folks make several products for athletes, including TriSwim (hair care), TriSlide (anti-chafe skin lubricant), and Foggies (anti-fog towlettes). The skin care line seems to be a relatively new endeavor and continues the company’s commitment to providing athletes top-notch personal care products. Athletes put their bodies through a lot of stress, including the environments we train in. Sun, wind, water, and sweat all exact their own tolls on our skin. The DERMASPORT skin care line is designed to nourish an athlete’s skin the same way that the athlete nourishes his or her body. 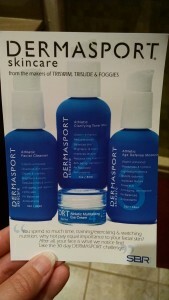 DERMASPORT skin care is gender neutral. I appreciated that the scent was not floral or “girly.” The bottles are rounded and ergonomic, and would seem to fit in anyone’s hand comfortably. Men and women can toss these into their gym bags and no one on their side of the locker room would give them any grief. They come in a nifty pouch you can throw in your gym bag. I used these products during my morning shower but did not use them at night. I washed my face in the shower, spritzed toner on a still damp but not dripping wet face, and applied moisturizer before putting on my make-up. I discontinued use of the eye cream after about a week, but for the time I was using it I applied it right after moisturizing. These products are designed for use on the face and neck, so that’s where I used them. I guess there’s nothing stopping you from filling your scrubby sponge with the cleanser and washing the rest of your body, but it’s probably not the most economical body wash. The skin care line is a four-step process: 1. cleanse, 2. toner, 3. moisturizer, 4. eye cream. Ideally you use all four products since they are designed to work together, though you certainly can use them individually. One of the pamphlets challenges consumers to take the 30-Day Challenge. I decided to start my 30 days on the 2nd day of the month. After a weeknight workout, I grabbed the face wash and jumped in the shower. I was pleasantly surprised by the scent. I hate floral scents as they are like an ice pick jabbed straight through my sinuses into my brain. But this was spicy and earthy. Not too overpowering, but definitely noticeable. A single pump was sufficient: it created enough froth to feel like I cleaned my face but it wasn’t wasteful. When I finished my shower, I dried my face and sprayed on the toner. When I previously used toner, I would completely saturate the cotton pad and even then it seemed like I couldn’t get great coverage of my whole face. And once I was done my face burned from the alcohol. This was not the case with this product. You spray the toner directly on, so no need to use multiple cotton pads every day. The spray disperses nicely, so a single one will cover your whole face. And it doesn’t contain alcohol so it doesn’t burn. After letting the toner dry (just a minute or so), I used a single pump of the moisturizer. It wasn’t as thick as my normal moisturizer, but I wouldn’t say it was thin or oily. I got good coverage and my skin didn’t feel greasy. Finally, I applied a bit of the under-eye cream. This was harder to get the right amount of, because I just barely touched my finger to the cream and got so much that I had enough to apply to both under-eyes and eyelids and still had a bit left over. Unfortunately, this is not the right product for me. First, I need as few steps as possible in order for me to follow a face wash regimen; four steps is way too many for me to follow with any regularity. Second, I missed the feel of having some kind of exfoliant; since I make my own exfoliant from oatmeal and almonds I could have added it into the product, but I wanted to give the cleanser a fair chance on it’s own. Third, I have very sensitive skin and the under-eye cream caused an uncomfortable sensation when I applied it; DISCLAIMER: I highly doubt my experience is typical and cannot say that anyone else would have this reaction…even my dermatologist is surprised by some of the reactions I have to the most hypoallergenic products on the market. Fourth, while I can’t prove that the acne breakout I experienced during the month I was trying the product was related to the product, and I definitively say that my acne didn’t get better while using this skin care system. To be fair, I might not have been the best tester for this skin care line. While I did want to give this product a fair shake, due to my long history of sensitive skin, I’ve pretty much just started making my own face wash, and once you’ve come to that conclusion it’s hard to go back to commercial products. (But, how awesome would it have been if this had finally been the product that could save me the effort of making my own?!?!). Plus, I know I have little patience with multi-step skin care processes, so I was already a little prejudiced. But I did follow the 30-day challenge faithfully and can conclude that while this isn’t the right product for me, it probably is the right product for a lot of people. How can I say it’s probably right for a lot of people? Well, because it checks a lot of the boxes of things I look for in a product, like: all-natural ingredients, alcohol-free, easily transportable and spill-proof containers, and options for either dry or normal-to-oily skin. Plus, I didn’t have a particularly bad experience with this product, it just wasn’t enough to convert me. And I will probably keep using these at the gym until they are gone (because I really don’t like wasting stuff that’s perfectly useful). Neither Jennifer nor Casual Runner received any compensation for this review. The product reviewed herein was provided by the manufacturer for purposes of this review and the opinions are solely those of the author.